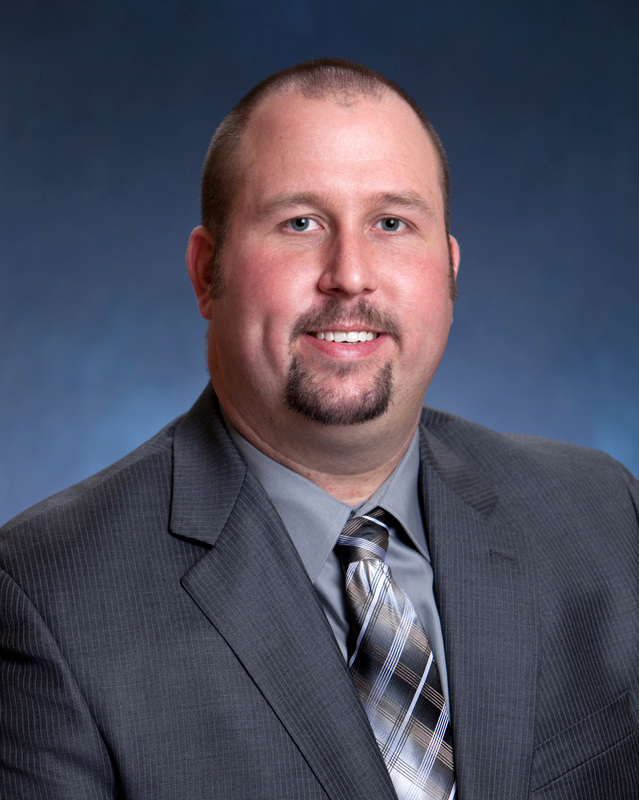 Gerad Troutman, MD, FACEP was born, raised, and educated in Wichita Falls, TX. He attended medical school at Texas Tech and completed his Emergency Medicine training as Chief Resident at the University of Mississippi Medical Center. Dr. Troutman returned to West Texas where he worked 4 years at the region's only Level 1 Trauma Center, University Medical Center in Lubbock. Dr. Troutman was the department's Education Director where he managed medical students and has been a mentor to many emergency medicine students. He is currently the EMS Medical Director for both Lubbock and Amarillo, where he oversees nearly 1,000 providers and more than 70,000 911 calls a year. He has brought state of the art pre-hospital care to these major metropolitan cities of West Texas. Dr. Troutman is also a part-time assistant professor of medicine at Baylor College of Medicine where he supervises and teaches emergency medicine residents at Ben Taub General in Houston, TX. Dr. Troutman is a state leader in medicine; he currently serves as the board treasurer for the Texas College of Emergency Physicians and is past chair of the Young Physicians Section of the Texas Medical Association. He also serves on many other committees within TCEP, ACEP, GETAC, and the TMA that strive to better Emergency Medical Care in Texas and our country. Dr. Troutman was awarded the Rising Star Physician Award three years in a row by Texas Monthly Magazine. He resides in Amarillo, TX with his wife, Ashley, and their two boys, Cash and Colt. In his spare time, he and his family like to travel, dine, and hunt. Dr. Troutman believes that state of the art emergency medical care should be provided timely by friendly, local Board-Certified Emergency Physicians and emergency-trained staff in a nurturing, calm environment. He also believes the same high quality care that is offered in large cities across the country should be offered to the citizens of West Texas. This is his goal as a co-founder and Chairman of ER Now – Your 24/7 Emergency Room. Carl Paetzold, MD, is a Texas panhandle native, born and raised in Hereford, TX. He attended medical school at the University of Texas at Galveston and completed his Emergency Medicine residency at Wake Forest University in Winston-Salem, North Carolina. Dr. Paetzold joined Amarillo Emergency Physicians in 1997, where he served as a partner and physician until 2014. He has served the medical community in numerous leadership roles including Emergency Medicine Services Director for regional EMS agencies, medical director for Panhandle Emergency Medical Service System and Amarillo Medical Services, executive committee member and chairman of Quality Improvement/Quality Assurance Committee for the Regional Advisory Council for Trauma Service A. Dr. Paetzold also served as Chief of the Emergency Department for Northwest Texas Healthcare System. Dr. Paetzold supports the Texas panhandle through volunteerism for 24 Hours in the Canyon, Tri to Make a Difference and other local fundraising charities. His global support has included medical mission trips to Jamaica, Mexico, Ecuador and Honduras. He and his wife, Dallas, have four children, Paris, Connor, Carson and Cooper. As one of the co-founders of ER Now, Dr. Paetzold believes that patients deserve a choice when it comes to emergency care. He proudly serves as Chief Operating Officer for ER Now, and enjoys giving patients quality emergency care in a comfortable environment. Matthew Turney, MD, FAAEM is a Board Certified Emergency Physician and has practiced emergency medicine for 21 years. Beginning his medical career as an EMT on the Fire Department in Roseville, California, Dr. Turney went on to receive a bachelor’s degree in Nursing at California State University in Sacramento, California. After working as an ICU nurse for several years, he returned to school, attending the Medical College of Wisconsin. He completed his residency in Emergency Medicine at the Medical College of Wisconsin at Froedtert Memorial Hospital in Milwaukee, Wisconsin. He is board certified by the American Board of Emergency Medicine. Dr. Turney and his family moved to Tillamook, OR where he worked as an emergency physician for 12 years. In Tillamook County General Hospital, he served as full partner of the physician group, while also serving for several years as vice-president and president of the medical staff at the hospital. He is a fellow of the American Academy of Emergency Medicine and has taught the oral board review course to emergency physicians for many years. He moved to Amarillo in 2012 and has practiced emergency medicine in Amarillo and the Texas Panhandle since then. He is a member of the Texas Medical Association. Dr. Turney had a unique opportunity to be involved in the Red Bull Stratos project and in 2012, he was the aeromedical doctor for the historic jump that broke several world records by Felix Baumgartner. The next year he provided medical control for Alan Eustace, who broke the high altitude record again. From these jumps, Dr. Turney coauthored several medical research papers. He has served medical missions to Afghanistan, Iraq, Nicaragua, Mexico, Haiti, Guatemala and Ethiopia. He also received the Medical Volunteer award by President George W. Bush. Dr. Turney has been married to Linda for nearly 30 years, and has three children and two grandchildren. He enjoys involvement in Hillside Christian Church, spending time with his family, riding mountain bikes, and occasionally writing computer programs. Dr. Turney is excited to be a part of the medical staff at ER Now, and looks forward to provide Amarillo with high quality emergency care. Dr. Turney serves as Chief Medical Officer for ER Now. 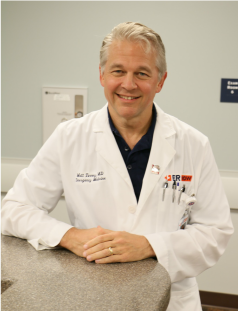 Tom R. Basye, MD, is a Board Certified Emergency Physician and has practiced Emergency Medicine for almost 20 years. Dr. Basye was born and raised in Levelland, Texas, where he graduated from Levelland High School in 1979. He received a Bachelor of Science degree in Business Administration from Lubbock Christian University in 1983, a BS in Pharmacy from the University of Texas in 1985, and a Doctor of Medicine from the University of Texas Health Sciences Center at San Antonio in 1995. He then completed his Emergency Medicine Residency at Wake Forest University - Bowman Gray School of Medicine in 1998. After finishing his residency, Dr. Basye and his family moved back to the Texas Panhandle where he practiced emergency medicine in Amarillo for more than 12 years. Before joining the group of physicians at ER Now, Dr. Basye worked as an emergency physician at the only Level I Emergency Center for the region: University Medical Center in Lubbock, Texas. As a physician on staff at UMC, Dr. Basye also served as an assistant professor of medicine for Texas Tech Medical School where he mentored medical students, nursing students, and medical residents. 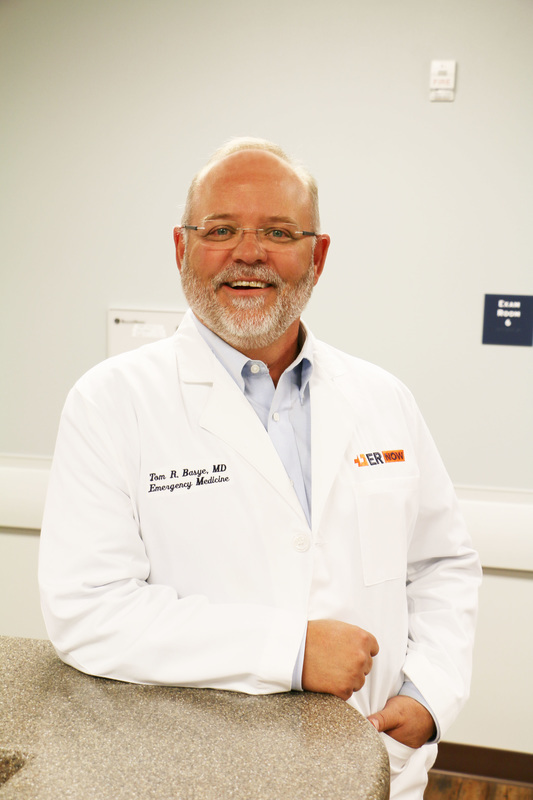 In each of his four years at UMC, he was awarded “Physician of the Year” by UMC Emergency Center staff. Dr. Basye was also selected as “Physician of the Month” two different times by the UMC Physicians’ Board. He has served on various boards and committees at each of the hospitals where he has been employed, and he is a member of both the American College of Emergency Physicians and Texas Medical Association. ​Dr. Basye has been married to Cherise (Brothers) Basye for 35 years. They have three grown children and one precious grandson. He enjoys spending time with family, traveling the backroads of the Hill Country, going to baseball games, and participating in mission trips. Dr. Basye has traveled with various student groups to Guyana, Ecuador, and Peru where he spends time caring for patients while instructing future healthcare providers. As a Board Certified Emergency Physician with ER Now, Dr. Basye is excited to provide the Texas Panhandle with a new and innovative approach to quality emergency care. Dr. Basye serves as Chief Financial Officer for ER Now. Dr. Yagnesh Desai, MD, originally a Louisiana native, is a Board Certified Emergency Physician. He has been treating patients in the emergency room since 2007. Dr. Desai received his undergraduate degree in Biological Sciences at Louisiana State University and obtained his Doctor of Medicine at the LSU School of Medicine in New Orleans in 2007. He completed his residency at the University of Mississippi Medical Center where also became chief resident. He is certified by the American Board of Emergency Medicine as well as Advanced Trauma Life Support, Advanced Cardiac Life Support and Pediatric Advanced Life Support certifications.He is a member of the American College of Emergency Physicians, TMA, and American Academy of Emergency Medicine. 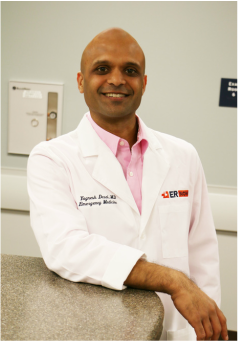 Dr. Desai most recently served as the Medical Director for Air One Flight EMS in Tyler, Texas an worked at the East Texas Medical Center, a Level 1 Emergency Department that served more than 50,000 patients per year. Prior to that, he practiced emergency medicine at Mercy Regional Medical Center and St. Frances Cabrini Hospital, both in his home state of Louisiana. Dr. Desai and his wife of 7 years, Hemali, moved to Amarillo with their son, Shyam, in order to join the ER Now team and provide quality emergency care in our freestanding emergency center. When he's not working, Dr. Desai enjoys playing basketball, working out and watching football. ​He and his family are excited to be part of the panhandle community. Patrick J. Kirkland, MD, FACEP is a Board Certified Emergency Physician. Dr. Kirkland completed residency training at the University of Mississippi Medical Center and has been treating patients in the emergency room since 2007. He was selected to attend high school at the Mississippi School for Mathematics & Science and obtained a Bachelor of Science in Microbiology at Mississippi State University. 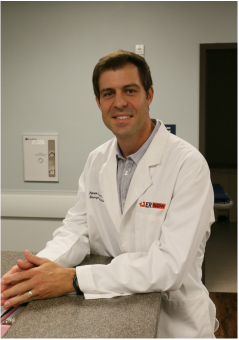 Dr. Kirkland achieved his Doctor of Medicine at the University of Mississippi in 2007 and recently became a fellow of the American College of Emergency Physicians. Dr. Kirkland worked in the emergency room at Rush Foundation Hospital in Meridian, Mississippi. The 215 bed medical center has a service population of 300,000 and functions as a referral center for five critical access hospitals. Dr. Kirkland served as Vice Chief of the Emergency Department, where he helped implement numerous policies to provide exceptional care to his patients. Dr. Kirkland gained invaluable experience leading his team in treating a wide range of ailments including frequent life-threatening trauma and medical conditions. During this time, he served as Adjunct Professor for William Carey University where he trained many medical students to excel in the ER. Dr. Kirkland served on the trauma committee and worked with other leaders to bring acclaim to his hospital for providing excellent trauma care. During this time, he also worked on other committees to ensure the hospital was fiscally responsible while providing quality care to its patients. Dr. Kirkland helped combat physician shortages by working in multiple other emergency departments including Baptist Health Systems in Jackson, MS and Anderson Regional Medical Center in Meridian, MS.
Dr. Kirkland moved his family from Mississippi to Amarillo, Texas in the spring of 2016 out of a passion for the freestanding emergency center model. He is excited to be part of a team providing quick, quality, patient-centered emergency care for the people of the Texas Panhandle. His wife of 8 years, Courtney, and small children are enthusiastically becoming a part of the local community. When not at work, Dr. Kirkland enjoys helping educate his children at home, hunting, working outdoors and discovering the many intriguing aspects of Amarillo. He and his family have been embraced by a warm welcome to their new Texas home. 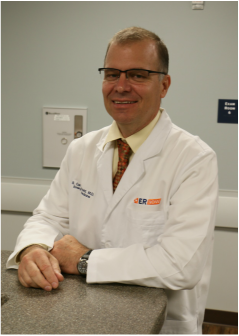 Dr. Kirkland is very proud to offer his energy and enthusiasm to serve the community and will be working hard to make ER Now your “ER home”. 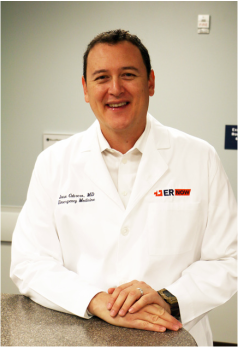 Dr. Jose Cabrero, MD is a Board Certified Emergency Physician and has practiced Emergency Medicine for 16 years. Originally from El Salvador, Dr. Cabrero received his undergraduate degree from New College of Florida in Sarasota, FL. He obtained is Doctor of Medicine from the University of South Florida in Tampa, FL and completed his emergency medicine residency at LSU School of Medicine in New Orleans, LA. Dr. Cabrero is excited and grateful for the opportunity to serve Amarillo once again. He was a partner at Amarillo Emergency Physicians prior to moving to the Dallas/Ft. Worth area where he practiced emergency medicine in Dallas and Greenville. He is trilingual (English, Spanish and French) and has been on medical mission trips in Haiti and Brazil. ​ He and his wife, Cynthia, have three young daughters and enjoy traveling in their renovated 1970s camper. Dr. Cabrero has traveled extensively, living in Belgium and France.